Thanks to a generous and wasteful grant from the Knight Foundation, PolitiFact is reaching out to red state voters! These outreaches suspiciously correlate to new PolitiFact state franchises, in turn making it look like the Knight Foundation wants to help PolitiFact advertise itself. Daniel Funke of the Poynter Institute posted a story about the Oklahoma leg of PolitiFact's dog & pony show. We reviewed that in our first part in this series. This installment concerns a Washington Post story about the third and final stage of the evangelism and revival tour, ending up in West Virginia. What's the Purpose of This Tour, Again? The Post article leads with a section that more-or-less paints PolitiFact's outreach as a failure. PolitiFact planned to go out and tell people PolitiFact is nonpartisan and fair and let them see, at least to some degree, how PolitiFact works. That was supposed to lead to greater trust. But when given the opportunity to make that case, PolitiFact editor Amy Hollyfield comes across like Eeyore. Amy Hollyfield of PolitiFact, the Pulitzer Prize-winning fact-checking organization, considers the question. She hesitates a beat before telling Epstein and about 65 others in the audience that maybe you can’t. Not all the time. Well, that's encouraging! What else does Hollyfield have? Specifics? Aren't specifics always foremost in the minds of journalists? Okay, maybe Hollyfield gave the specifics. Maybe the Post's Paul Farhi left them out. But it seems to us beyond question that if the idea of the evangelism tour is to build trust of PolitiFact in red states then PolitiFact should focus on those specifics, whatever they are. What? It would be great to have some specifics on that. Pretty much the best description we have of the difference between PolitiFact's "False" and "Pants on Fire" ratings is PolitiFact Editor Angie Drobnic Holan's immortal "Sometimes we decide one way and sometimes decide the other." We'd like to know even more about this occult-yet-objective (?) process. But there's nothing new in the Post article. So not today. Sharockman has the Evidence of Neutral Nonpartisanship (not)! Just a few days ago we published a chart showing PolitiFact has published more fact checks of President Trump between his inauguration and Oct. 18 than it did of President Obama over the same period in 2009 and 2013 combined. We did it to show the utter ridiculousness of Executive Director Aaron Sharockman's argument that fact-checking Obama frequently serves as an evidence of PolitiFact's neutrality. As we pointed out in our earlier article accompanying the graph, yes of course national fact checkers check the president the most. That will be true regardless of party and therefore serves as no evidence whatsoever of impartiality, particularly if a Republican president may have drawn greater scrutiny than Obama. Sharockman's argument is flim-flam. This article about PolitiFact trying to convince conservatives it is neutral and non-partisan gives conservatives no evidence of PolitiFact's neutrality or non-partisanship. These people could use some talking points that have greater strength than wet toilet paper. Hey, the article mentions "PolitiFact Bias"! The basic critique is that fact-checkers cherry-pick statements and facts to create a false impression — usually that conservative candidates are less truthful than the liberal kind. The fact is that the polls show that moderates and independents are more skeptical about mainstream media fact-checking than are Democrats. The corollary? The political group that most trusts political fact-checking is Democrats. Shouldn't we expect moderates more than Democrats or Republicans to favor PolitiFact if it treats Democrats and Republicans with equal skepticism? Indeed, for years PolitiFact tried to argue for its neutrality by saying it gets attacked from both sides. Left unsaid was the fact that most of the attacking came from one side. PolitiFact needs to hear the message in the numbers. Likely voters don't trust fact checkers (71 percent!). PolitiFact can't do meet-and-greets with 71 percent of likely voters. To earn trust, PolitiFact needs to severely ramp up its transparency and address the criticism it receives. If the criticism is valid, make changes. If the criticism is invalid, then crush entities like PolitiFact Bias by publicly discrediting their arguments with better arguments. Establish trust by modeling transparently trustworthy behavior, in other words. Or PolitiFact can just keep doing what it's doing and see if that 30 percent or so that trusts it just happens to grow. The fact of the matter is that both sides are becoming less moored to the truth, Sharockman says. The number of untrustworthy statements by Republicans and Democrats alike has grown over the past three presidential cycles, he noted. 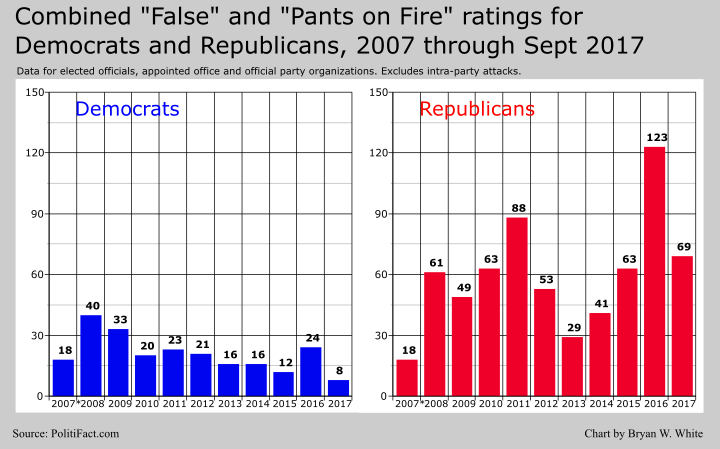 Our numbers show that the number of false ("False" plus "Pants on Fire") statements from Democrats, as rated by PolitiFact, drop from PolitiFact's early years. Though with a minor spike during the 2016 election cycle. What data would support Sharockman's claim, we wonder?